PESHAWAR: Provincial Election Commissioner, Khyber Pakhtunkhwa, Pir Maqbool Ahmad, on Saturday warned elders and election candidates against making agreements for the women’s disenfranchisement, saying the practice is an offence punishable up to three years imprisonment or fine of Rs100,000 or both. 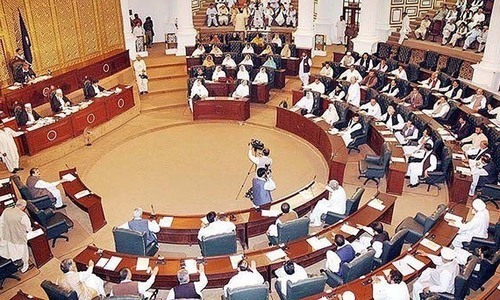 Referring to a report of the Trust for Democratic Education and Accountability about voting restriction for women in several areas of KP and tribal region, the PEC warned the local elders and candidates that if women were barred from casting vote through any agreement or any hurdle was created in that respect, the Election Commission of Pakistan would take action under Section 9 of the Elections Act, 2017. He said under the law, the ECP was empowered to declare void election in a constituency, where the number of votes cast by women was less than 10 per cent of the total cast votes. The areas pointed out by the TDEAare part of NA-11 Kohistan, NA-12 Battagram, NA-20 Malakand, NA-26 Nowshera, NA-36 Lakki Marwat, NA-40 and NA-41 Bajaur tribal region, and NA-43 Khyber tribal region. The reasons cited by the trust for restriction on women voting include cultural barriers, long distance from polling stations, fear of electoral violence, restrictions by candidates, agreement among elders, and lack of political awareness. The PEC said candidates and elders of those areas shouldn’t enter into any such illegal agreements and instead, they should take steps for bringing more and more women to polling stations for casting vote. He asked the relevant district returning officers and returning officers to take steps for foiling agreements against women’s disenfranchisement. Mr Pir Maqbool said the relevant deputy commissioners, who were serving as the district monitoring officers for elections, should check attempts to bar women from casting vote in their respective areas.